The multi-award winning quintet Goitse brings its distinctive sound of Irish traditional music to Lawrence University’s Harper Hall Monday, Feb. 26 as part of the university’s World Music Series. Tickets for the 8 p.m. are $10 for adults, $5 for seniors/students and are available through the Lawrence Box Office, 920-832-6749. Goitse is James Harvey, Tadhg Ó Meachair, Áine McGeeney Colm Phelan and Conal O’Kane. 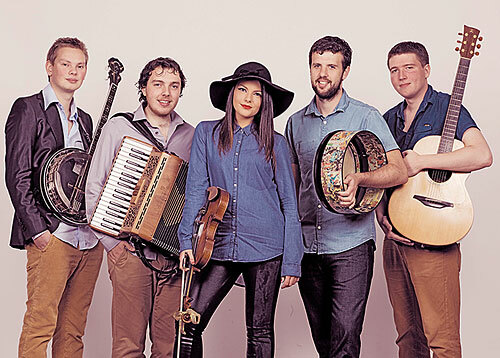 Known for the quality of their own compositions interspersed with traditional tunes from Ireland and abroad, Goitse was launched at Limerick University’s Irish World Academy of Music and Dance. Crowned Live Ireland’s “Traditional Group of the Year” in 2015, the band has since added Chicago Irish American News’ “Group of the Year” and Germany’s prestigious “Freiurger International Leiter award in 2016 to its resume. The band consists of All-Ireland bodhrán champion Colm Phelan, South Philadelphia native guitarist Conal O’Kane, the sweet, charismatic voice and energetic fiddle playing of Áine McGeeney, award-winning banjo and mandolin virtuoso James Harvey and Dublin piano and piano accordionist Tadhg Ó Meachair, who bridges the gap between melody and accompaniment.